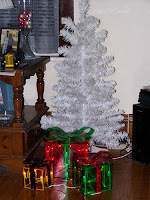 White Christmas Tree, and 3 lighted gifts all on floor in this picture. 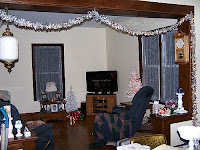 Since this picture I have moved the white tree up onto the end table next to it at left, have the tall glass vase holders with pink, white, and silver bulbs in them on each side of the tree. In front of tree is a glass candle holder with christmas print on it, and sitting on each side of that candle holder is a red rocker ornament that says Grandma with a pillow, and a green rocker ornament that says Grandpa. 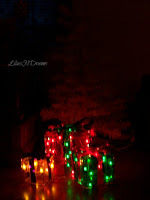 Picture below this is without the flash showing the lighted gifts again. 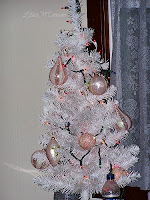 White Christmas tree on other end table in living room with different pink ornaments hanging on it, and colored lights as well. 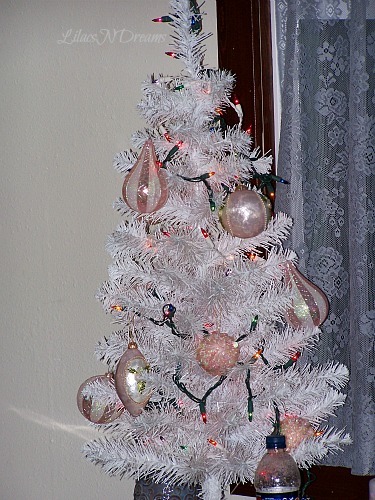 Same White Christmas tree from above, but tried it without the flash this time. 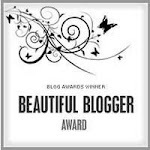 Sorry, got a bit blurry, and my editing could not fix all of it. 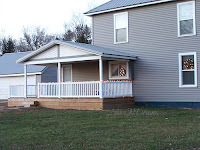 Coming from the front porch is our longer porch on the side of the house. In the window...which is our dining room is a wreath with lights. 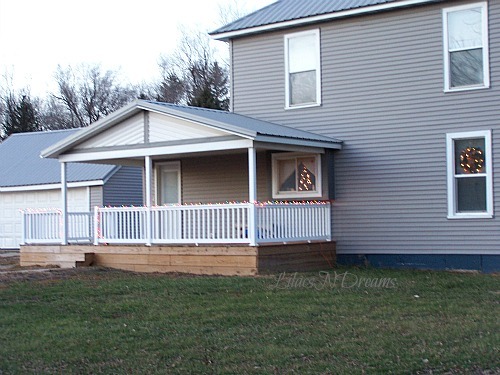 In the kitchen bay window is the blue christmas tree, and the porch rail has colored lights going along them. 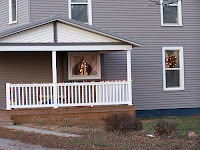 Here is more of a close up of some of the longer porch with the colored lights on the porch rails, lighted wreath in the window, and again the christmas tree in the kitchen bay window. 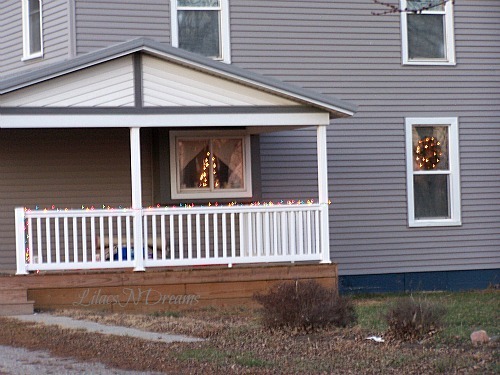 Christmas Decorating With Lights, Trees, and Fun. 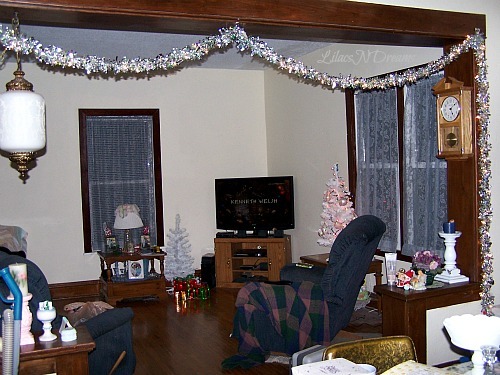 I am one who enjoys Christmas, and all the decorations with it too. This year I still do not have as much done as I normally woud do, but was able to get some of it done to make it festive for company soon to be here. 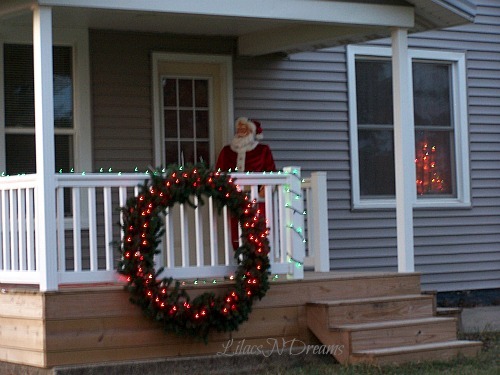 I generally have different blow ups that are in the yard, lighted moving reigndeer, and etc. For the first time I was doing this by myself too. Excuse the messes in the picture showing the living room. Whew! 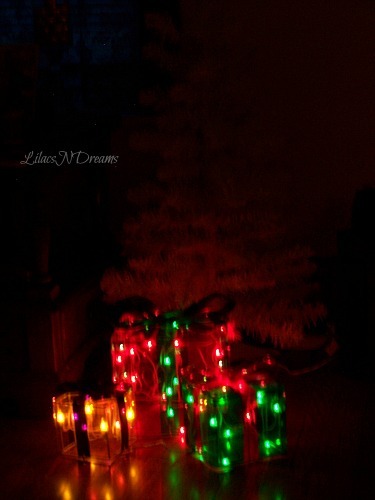 Had lights all strayed out testing them, moving things around to make room, and also trying to work on a few pieces that will be offered in my shops for sale too. Christmas is not far off now. About 14 days away now. 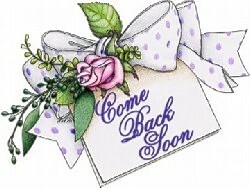 I am not done with things yet, quite a bit more to do, mostly getting ready for company to be here for a couple of days. Daughter, and grand baby will be visiting from out of state for about 3-4 days, son will be home from army basic training for couple of weeks, and the joy of people coming and going as they please, and get around. 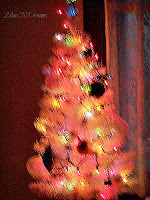 Christmas day will just be a lounging time for us as we are doing things a few days prior to that with all the schedules of everyone. Daughter, and grand baby will be leaving back home on that day. So, enjoying all that we can, while we can. 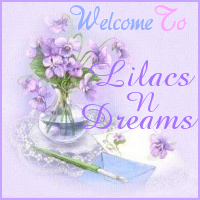 Thanks so much for sharing your time at LilacsNDreams today. 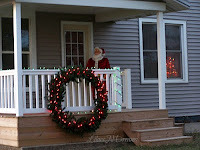 Hope everyone is ready for this festive holiday, and able to do all that you are wanting to do. Take care everyone. Enjoy, have fun, be merry, and see you all again soon! 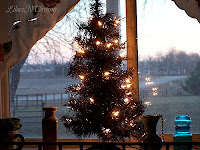 Have a wonderful week, and MERRY CHRISTMAS TO ALL ! !